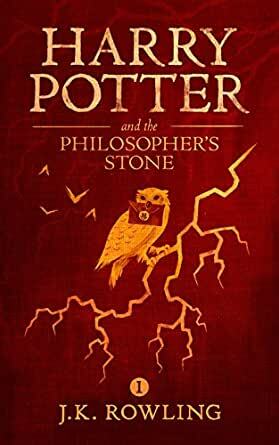 Harry Potter and the Philosopher's Stone is JK Rowling's enchanting debut novel. This magical, gripping, brilliant book--a future classic to be sure--will leave children clamouring for a sequel. Say you've spent the first 10 years of your life sleeping under the stairs of a family who loathes you. Then, in an absurd, magical twist of fate you find yourself surrounded by wizards, a caged snowy owl, a phoenix-feather wand and jellybeans that come in every flavour, including strawberry, curry, grass and sardine. Not only that, but you discover that you are a wizard yourself! This is exactly what happens to young Harry Potter as the story unfolds. 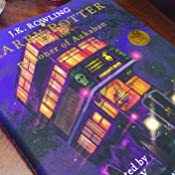 In the non-magical human world--the world of "Muggles"--Harry is a nobody, treated like dirt by the aunt and uncle who begrudgingly inherited him when his parents were killed by the evil Voldemort. But in the world of wizards, small, skinny Harry is renowned as a survivor of the wizard who tried to kill him. He is left only with a lightning-bolt scar on his forehead, curiously refined sensibilities and a host of mysterious powers to remind him that he's altogether different from his aunt, uncle and spoilt, pig-like cousin Dudley. 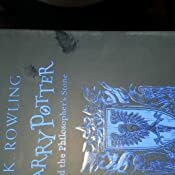 Just received my copy of Harry Potter and the Philosopher's stone and I am in pure awe. 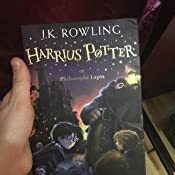 If you are a parent and want to give one of the most amazing story to your child, or if, like me you're a fan of Harry Potter and want to give yourself a little something: it's a must have! The whole text is in there alongside dozens of amazing drawings to make the story even more magical. This is only the first book, and all of the serie is going to be published like that. It is truly incredible, the art is stunning and a lot of time, love, dedication and talent was poured into this book. The book is bigger then your regular pocket novel, it's about the size of an encyclopedia. Literally every house edition I received came with greasy finger smudges on the book jacket. 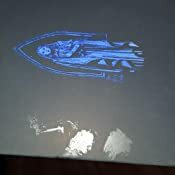 As this is a COLLECTOR edition - that is unacceptable. Amazon was kind in remedying the situation. The book itself is very nice. The book that introduced us all to the wonders that is Harry Potter. It's a wonderful story that just absorbs you into a world that we could only dream of being a part of. The enchanted version ibooks has is simply stunning and a definite for any collector. The images are gorgeous and really let you become a part of the story. 5.0 out of 5 starsAn absolute must-have for fans! 5.0 out of 5 starsSUPER BEAUTIFUL! Amazing Amazing AMAZING!!! Harry Potter fan or not - this book is Beautiful. It's heavy, big, Hardcover. Each page is glossy and every other page or so is a very creative drawing. If there is no drawing then the pages themselves have a bit of a background tint to it, maybe blotches of ink smudged to give them a great effect. The book also has a red thread for a bookmark which is super useful and the cover on the book can be removed if you want to put it aside and not ruin it with wear and tear. It's a great gift for a Harry Potter Fan - like myself, even if they already own a copy of the book. The drawings just really bring it all to life. I cannot wait for the 2nd book to come out next year with pictures as well! This makes story time with our kids even better. My father had a version of the Hobbit with art from the Rankin/Bass animated movie much like this book and my kids loved us reading it too them and looking at the illustrations while we read. This was a no brainier then and has achieved the same results. The illustrations are amazing and it's the same great book you know and love. Wow. I’m falling in love with this story all over again with this exquisite book. I’ve read all the HP books years ago and now that I have kids, I figured I’d purchase the illustrated editions. They do not disappoint. The artwork is so beautiful; I’m so happy I bought all 3. I look forward for them to release the others! It is a wonderful edition for younger generations and for any fan in general.